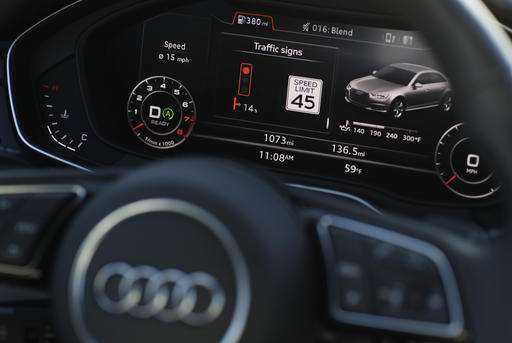 On the theory that a driver who knows when a red light will turn green is more relaxed and aware, vehicle manufacturer Audi is unveiling this week in Las Vegas a technology that enables vehicles to "read" traffic signals ahead and tell the motorist how long the wait will be. It's a simple display for the driver—a dashboard traffic signal icon and a timer next to the digital vehicle speed and area speed limit displays already common in newer cars. The technology behind it is more complex. It uses 4G LTE cellular communication between the vehicle and a centralized traffic management control network— dubbed vehicle-to-infrastructure or "V2I." Audi offers it through a subscription service not unlike commercial satellite radio. The company calls it "traffic light information." Company executive Pom Malhotra terms it "time to green." "You don't have to constantly stare at the traffic light. You have that information right in front of you," Malhotra told reporters who test-drove the system Tuesday in vehicles on and around Las Vegas Strip. Can't see the light because there's a tour bus ahead? No problem. The icon says you have 37 seconds. "A lot of behavior in the car changes," Malhotra said. "You have time to relax your hands and shoulders ... time to hand a milk bottle to your child in the back seat ... while knowing you're not taking attention away from the road." Audi and Regional Transportation Commission of Southern Nevada officials said Tuesday that Las Vegas was picked for the first-in-the-nation debut because it has a single centralized traffic management center covering all jurisdictions in Clark County, a region nearly the size of New Jersey. 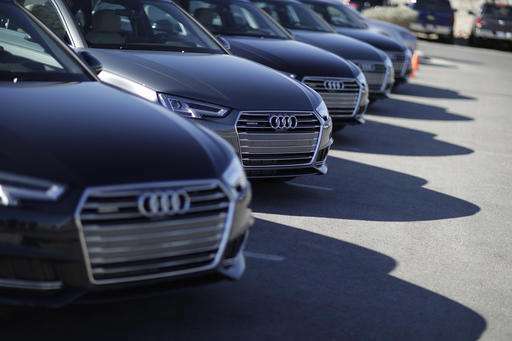 Malhotra said Audi hopes to expand the system soon to other big U.S. cities, including places like Los Angeles, which have patchwork traffic management systems run by varying jurisdictions in a sprawling urban landscape. 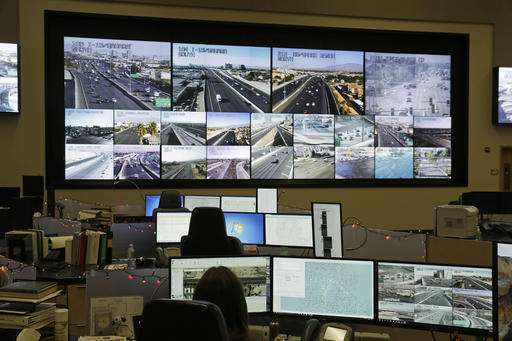 The Las Vegas-area program, dubbed the Freeway and Arterial System of Transportation, or FAST, collects data and synchronizes 1,300 traffic signals in a region home to more than 2 million people and host to more than 40 million tourists a year. It also has 508 cameras and freeway flow detectors, and controls 106 message signs and freeway on-ramp meters. Tina Quigley, transportation commission general manager, said other car companies will be able to tap into the Las Vegas data, which she said should improve mobility and safety—particularly in the congested Las Vegas Strip tourist corridor and around McCarran International Airport. About 150 Audi owners are using the system in Las Vegas, Malhotra said. The car company official called the debut of the commercial service "a small step forward in V2I," but a key demonstration of the kind of technology that will enable vehicle-to-vehicle communication and driverless cars. Using cellular communication for smart car systems differs from vehicle-to-vehicle and vehicle-to-traffic signal programs using dedicated short-range communication. DSRC has been tested since 2012 at the University of Michigan, said Debra Bezzina, senior program manager for the Ann Arbor Connected Vehicle Test Environment. The university Transportation Research Institute program is backed by several federal traffic safety, research, trucking and transit agencies, and pilot programs are slated for Wyoming, New York and Tampa, Florida. Bezzina said properly equipped vehicles with DSRC are able to detect traffic signal phase signals at intersections. "If the light has turned yellow, it can tell the driver, 'You're not going to make the light,'" Bezzina said. Audi spokesman Mark Dahncke said his company expects other car companies will develop similar cellular-enabled technology, or could piggyback with its program contractor, Traffic Technology Services. "We are blazing a trail that does not lock anyone else out," Dahncke said. "You don't have to constantly stare at the traffic light. You have that information right in front of you,"
Or because he is behind a car without it, which will be the rule for a long time. Get into the car horn business. I know when the light will (often) turn green - within a second of my car coming to a stop. I'd be more interested in a "speed to green" technology that tells you at what speed to approach a light that is red (or going to be) so that it will be green and any cars stopped by it are rolling again by the time you reach it. I know this will not always be possible if things are really backed up or the light is just plain long, but would be helpful at a lot of the intersections I come to each day. I'll bet he was driving a polluter, and not a green car.